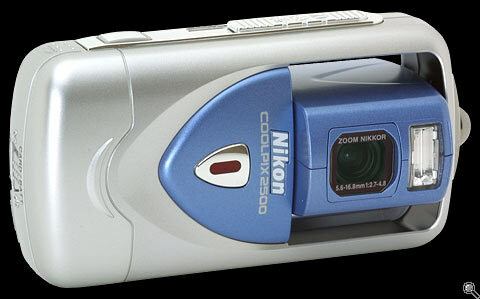 The Nikon Coolpix 2500 was announced on 21st February 2002 as a part of Nikon's new offerings at the PMA 2002 show. The 2500 marks a stylish design departure from the 775 and 885 but also brings familiar echoes of the split & twist bodied Coolpix 900, 950, 990 and 995. The 2500 is clearly targetted at a relatively young 'trendy' market, those who are looking for quick easy to use (and stylishly designed) digital cameras but cameras which can also deliver a certain level of image quality. 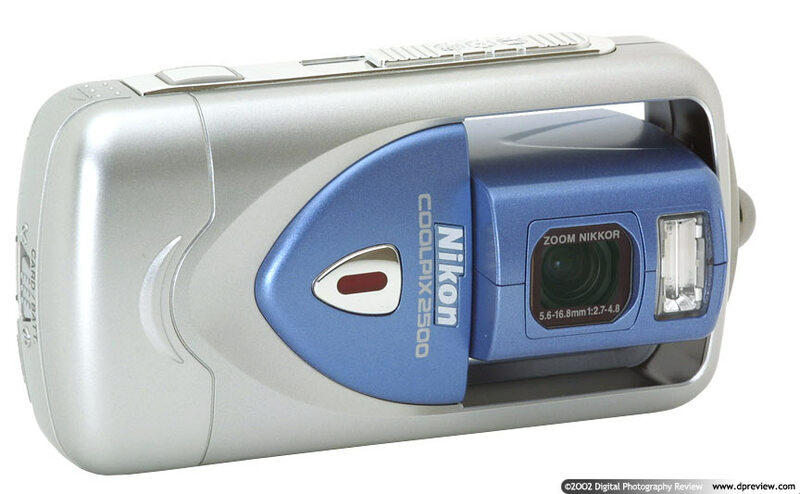 The 2500 features a 2 megapixel CCD sensor and a 3x optical zoom lens, because of its clever 'internal twist' design the lens and flash unit are protected when rotated to the vertical position. This makes the 2500 an ideal coat pocket or handbag camera, there's little need for a separate case and there is certainly no lens cap. Thanks to the double swivel (lens portion is connected to the main body on both the left and right side) there's also no flex or potential to damage the swivel mechanism. Because of the 2500's internal zoom / internal focusing lens there's no extending lens mechanism to get damaged (unlike many other compact digital cameras). About the worst thing that could happen to this camera if it were knocked would be that the rotating portion is flipped back into its protective vertical position.